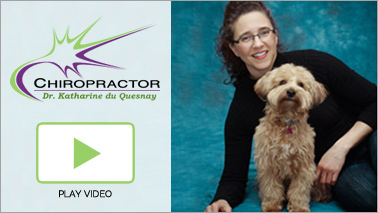 Brooklin Chiropractor : Dr. Katharine du Quesnay, D.C.
What’s the best way to choose a chiropractor in Brooklin? You’re doing it! Spend some time here exploring our chiropractic philosophy and our patients-centric procedures. After you tour our website designed to serve those looking for a chiropractor in Brooklin and the Durham and Scugog areas, please give me a call! I’d love to meet you and tailor a plan to address your unique challenges. Happily serving Brooklin, Whitby and Port Perry communities! Dr. du Quesnay is a very kind and caring person. Very professional and warm. Awesome. I have less pain in my neck and shoulders and it has only been a week. I was very impressed with all the courtesy, professionalism and knowledge of all the staff. Wonderful experience overall. I wish we would have come sooner! Glad I went for the visit. I am glad to have met Dr. Katharine du Quesnay. She is very good and has patience with me while explaining the procedure thoroughly in a way I understand. I highly recommend Dr. du Quesnay. I like the fact that I was educated about chiropractic in general and also about my specific issues. Thank you! Very impressed and pleased overall. I have nothing negative to say. I’m impressed by the thoroughness of the assessment, by the systems nature of it and by the manner in which information was shared with me. The office and practice seem to align with my values relating to health, wellness and human dignity and respect. I was very impressed with the courtesy, knowledge and professionalism of all the staff. I think I will enjoy my visits here and hopefully will feel better soon. Dr du Quesnay was the first practitioner (I had previously been to doctors/physiotherapists) who took the time to explain to me the actual results of previous x-rays and gave me an excellent understanding of how the findings impact my body function and recommended a sound treatment plan going forward. Thank you. Professional, extremely knowledgeable and friendly. Loca Location is excellent and Interior clean and well kept.